Van Angels: If Minnesota Can Ban 15 Passenger Vans for Student Transportation Why Can't Canadian Provinces? If Minnesota Can Ban 15 Passenger Vans for Student Transportation Why Can't Canadian Provinces? 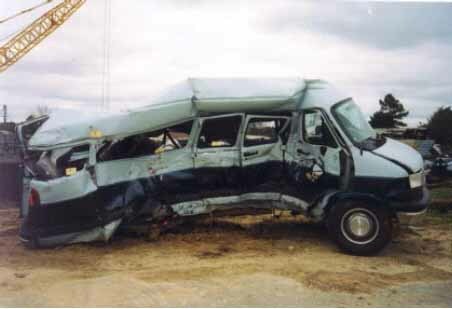 1996 Dodge 15 Passenger van transporting students from school to daycare involved in a crash with multiple fatalities in Bennettsville, South Carolina, February 16, 1999. 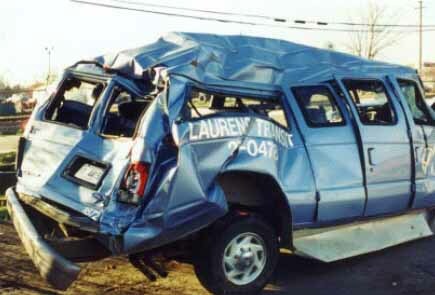 NTSB Photo. All vehicles utilized for school transportation in the State of Minnesota must meet Minnesota school bus safety standards, must be inspected annually by a Commercial Vehicle Inspector (CVI) of the Minnesota State Patrol, and must display a current Minnesota School Bus Inspection Certificate. Minnesota school bus safety standards comply with Federal Regulations and require that no vehicle larger than 10 passengers, including the driver, may transport school children unless the vehicle meets state and Federal standards for school bus design and construction. 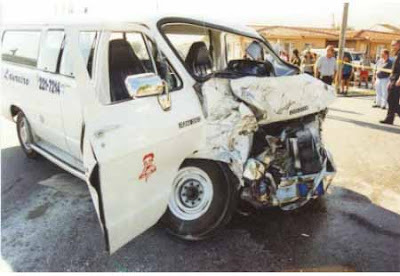 Non school bus vehicles over ten passengers, the driver, do not meet those standards. Daycare’s, churches, social service organizations, and youth organizations, who are the most frequent users of 12 and 15 passenger vans, are not prohibited from utilizing these vehicles when transporting children unless the transportation is to or from school, or on school related activities, under an agreement with a school or a school district. 1992 Dodge 15 Pasenger van transporting students to school under a private parent contract involved in an accident with a transit bus in Sweetwater, Fla., March 25, 1998. NTSB Photo. The National Highway Transportation Safety Administration is very concerned about the use of large vans to transport children and has recommended that daycare’s, church groups, and other organizations utilize vehicles which comply with Federal school bus standards. However, at this point these are recommendations only and non-school related organizations may continue to legally use these vehicles. Use of Nonconforming Vans: New vehicles that carry 11 or more persons that are sold for transporting students to or from school or school related events are required to meet all FMVSSs for school buses. A vehicle is regarded as being sold for use as a school bus if, at the time of sale, it is evident that the vehicle is likely to be significantly used to transport students to or from school or school related events. This applies to school buses sold to public as well as private schools. Thus, a dealer selling a new 12 or 15-passenger van to be used for school transportation must ensure that the van is certified as meeting all school bus FMVSSs. Click here to read the rest of this article on Saint Pauls Minnesota Public School website.